After two novels by Greg Bear that started strong yet left me unsatisfied by the end, most people would expect me to be finished with his books. But that just isn't the case, because it would take a serious failure to make me decide that. Besides the fact that he has at least one more Nebula-award winning book that I plan to read, this one interested me because it isn't sci-fi, it's fantasy. Perhaps few people make a distinction, yet there is a great difference between them. Fantasy books are usually magical, with imaginary worlds far removed from earth. They are typically based on feudal Europe or other civilizations that once existed. Science fiction, on the other hand, typically relies on technology and modern knowledge. It usually is related to our earth, and typically takes place in the modern world to far distant futures. Occasionally, clever authors try to mix the two together, but I rarely enjoy the result. The fact that Greg Bear wrote a fantasy novel piqued my interest, but it's not unheard of. After all, the two genres are lumped together at a bookstore. It's only natural that there is some crossover. All that aside, I thought it would be interesting to see what his writing was like when he was a much younger author, and to find out how different his style would be in regards to a different genre. 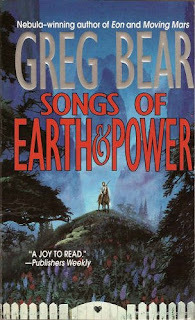 Songs of Earth and Power is actually two books put together into one. The first one, The Infinity Concerto, was published in 1984, and the second, The Serpent Mage, followed in 1986. Mr. Bear was a college student at the time, and he gives us a little history of the novel in an author's note in the back of the book. There, he shares a story of his attraction to a girl in one of his classes, with whom he goes on a few dates and generally unsettles due to his strong interest in her. The thing which makes it interesting is that he based one of his characters on her, and then, after putting the character into a sort of limbo, discovers that the girl in real life was involved in an accident and died. It caused him some mental anguish, although he seems ultimately to have pulled through it. The Serpent Mage wound up being dedicated to a girl who never even knew she had inspired a character in his book. With that tidbit of gossip finished, I should get around to sharing some of my thoughts. For once, Greg was successful in writing a book which I mostly liked. Certainly not everything was perfect, but enough that I was pleased. Perhaps best of all, the ending was not a letdown. In fact, the entire second portion was quite a bit more satisfying than the first. It began really well, with lots of mystery and colorful events taking place. Typical Greg Bear. And it stayed that way for a while, with the same thing occurring as in his other novels: I got used to the exotic world and people, and annoyed at knowing so little about what is going on. Just like his science fiction works so far. The first section disappointed further as the main character bumbled ignorantly through dangerous situations, surviving on dumb luck, charity, and a lack of any of the supposed danger. When leaving Lamia's place, he is instructed to be very cautious because the land is such a dangerous place. Days later, he is being trained by three sisters and running all over without much care. And though he does wind up hurt a few times, later knowledge makes me wonder why he was ever targeted, since everyone seems intent on keeping him alive as a tool, respecting other people's wishes that he stay alive, or ignoring him completely. So he bumbles about, gradually learning the rules in Adonna's realm, and eventually killing off enough of his enemies (rivals?) to get back home, which was his goal from the beginning. Along the way, there are some interesting characters, some puppy love (pre-infatuation with college girl, though, she was in the second part), and exotic locations which keep things from getting dull, yet there is a strong feeling of aimlessness as well. Things got better in the second portion. Adonna's realm is failing, and all of the sidhe (I guess these are Celtic/Gaelic fairy-folk) are returning through all of these portals to earth, where they once resided but left because of a strong dislike for humans. Take their lack of fondness for people, combine that with some human xenophobia and the rampant magic the sidhe are bringing back with them, and the earth is in a volatile state. Our hero, Michael, is pulled into the middle of things because he alone has the experience to deal with things. The experience, but not the knowledge. He sets out to learn, and with subliminal knowledge implanted during his training and some luck or intuition, begins one of the quickest rises to power ever witnessed. In a few months he is ready to vie with some other powerful characters for the role of mage, where he might be able to pull the earth through the rough times and keep total destruction from taking place. While I'm not too keen on dumb luck and convenient happenings (and there are some), what really made the last portion fun is the environment. You have conversations with Mozart, Mahler, and the Loch Ness monster (supposedly the snake in the garden of Eden), and trips to worlds created by other mages, very similar to 3-D virtual worlds in a MMORPG. It is very imaginative and quite fun, despite the danger. Whether Michael is able to succeed or not became unimportant because I was so caught up in the fascinating juxtapositions of characters from history and strange locations. There was quite an imagination at work in these books, and I liked it. One more thing I wanted to share as a positive element (sorry about the long reviews) was the strong role of the arts - things such as music, dance, art, poetry, architecture, and even oenology, the science of making wine. In Songs, artists with a strong enough mastery are able to create magic like opening portals and altering reality. I have performed and taught music, and believe that most of the beauty and richness in our lives is a result of artists sharing their gifts with the world. While public schools may feel that the basics like reading, writing, and arithmetic are the most important subjects, or that true success can only be measured by performance on standardized tests, I believe the arts give everything else that we do some meaning. The arts put some warmth and creativity into being human, and I happily support and agree with any recognition they get. Bottom line: this is a very imaginative work that will lead the reader through some interesting worlds indeed. Although there is the inevitable ignorance of what is going on being used as bait to continue reading, and a bit of dumb luck, coincidence, and aimless wandering, the story gives enough through creative environments and growth to make it worth picking up. This time, I felt like the mysteries were mostly resolved, and I wasn't lost by unexplained detail falling to the wayside. 1) I definitely agree there's a huge difference between fantasy and sci-fi. 2) The best thing about the book is there is a character named Lamia (did you know that's what I planned to name my first daughter, except I never had any?). 3) I like long reviews. This Lamia and her sister, Tristesse (both French words for sadness/sorrow?) were cursed by the Sidhe and made to be gatekeepers to Adonna's realm. Tristesse was turned into a vampire and is described as looking ancient and mummified. Lamia had been an elegant dancer. She was cursed to grow enormous, and was around 800 pounds and growing, with shedding skin to boot. "Tristesse" means "sadness" in french, but Lamia, as far as I know, doesn't mean anything in French, and it's not in my dictionary, either. Technically, Lamia is, in mythology, a demoness with the body of a woman and the tale of a serpant. I didn't know that when I decided to name the daughter that. Becky and I both just liked the name, only she liked Lamia Christine, and I liked Lamia Camille. "a demoness with the body of a woman and the tale of a serpant"
For some reason I thought Lamia also meant sadness or regret, but I probably mis-read it. Yes, the link to mythology is intentional, but as I didn't remember who it was and I've already returned the book to the library I left that out. Considering my fascination with mythology, I am constantly being surprised by science fiction and fantasy just how much mythology I don't know. I agree with you about the importance of the arts--it seems like their cultivation is put on the back burner in public education. Yeah, in high school, they just teach you the greeks, and even there, they teach it like there was this great, static system, where everything made sense. The amazing thing about mythology is how it changes over time, how a goddess splits and becomes a Catholic saint and a demon, or how now, for instance, an old saint is being made the Patron Saint of Television. And they don't just cut out arts, either. A whole world of interesting stuff is cut out in public education. Like Becky said to me and William when we were in Jerusalem and reading about the Armenian masacre, if you want to know about the world, you have to educate yourself.